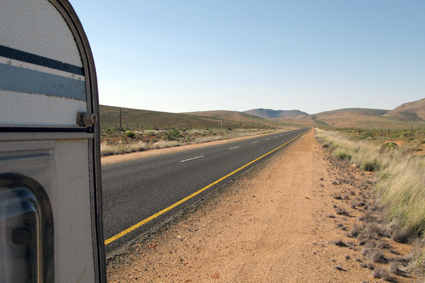 The next morning (Thursday 2nd) I took a drive, without the caravan, into Springbok to get petrol (Gulp!! it was worse) and to have a look around. Again it was a trip down memory lane as I used to travel to Springbok as a rep for then Reckkit and Coleman (not sure if the spelling is correct) and stayed there many times. I found the hotel I always stayed at, The Masonic, and it looks exactly the same as it did as it did then. Back to the park, hitch up and on my way to Port Nolloth via Steinkopf, Alexander Bay and then onto Brandkaros about 30 k’s from Alexander Bay where, after all the stories from my 4×4 man, I planned to spend a few weeks. The drive was great as there was very little wind and it was pretty flat, apart from one section, so I made good time and knew my petrol consumption was much improved. 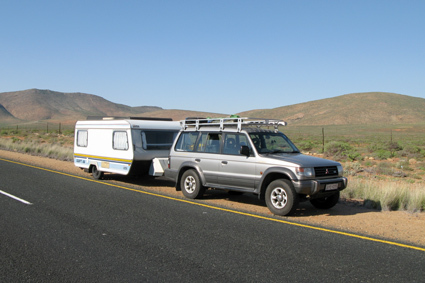 My set-up on the road between Springbok and Port Nolloth. As you can see the road is in good condition, it was a dirt road the last time I was on it, and pretty flat. Arrived at Port Nolloth about 11.30am had a quick look round and then onto Alexander Bay and Brandkaros. The road to Alex B. was also good and flat so made good time and was there by 2pm and that is where all my troubles started. My 4×4 man had told me that Brandkaros was fantastic and that the road was tar all the way. Ha-ha on both counts. From 3 k’s outside Alex the tar road became a dirt road and a bad one for towing a little old caravan like mine. I went about 20 k’s down the road and thought ” this is crap”!! I really thought the caravan was going to fall apart. The guy did not know what he was talking about. I even stopped and asked someone where the camp site was and they had no idea. So around I turned and drove all the way back to Port Nolloth as there was no where else to stay in Alex Bay. The site is huge, about 180 stands, and is situated right on the beach front. So far so good! Went to check in to be told the price was R123-00. I am used to half that for 1 person at an over 60’s discount, and there was no discount. 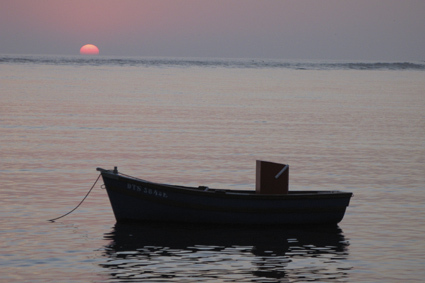 The reason – it was in season (read school holidays) and that was the price per site for up to 4 people. Reluctantly paid and went to find a site. I could choose from 178 as there were only 2 other caravans there. So much for in season. Had a chat to the lady about Brandkaros and she new exactly where it was – I must have stopped about 8 k’s from the camp site – so I have determined to give it another try tomorrow and just hope my caravan does not fall apart . The sites themselves are just hardened sea sand and you track the sand everywhere. Also the ablutions left a lot to be desired. Actually I could write a whole post on the ablutions at all the parks I have been to so far. They are all bad but some are really terrible. Anyway what can one do. Sorted out some food and had an early night. Pic taken from just in front of my caravan.